Dreambuilder Custom Homes recently completed a complete remodel of a master bath shower for the Strickland family in Jacksonville, FL, known as Dreambuilder Five. The prior owner of the Stricklands’ home had installed a fiberglass bathtub with walls and ceiling in the master bath. Not only was the unit unsightly, but it was so poorly installed that it was leaking both behind the walls and all along the edges on the exterior, causing damage. After the old bathtub was removed, the area was gutted and enlarged, opening up the space. 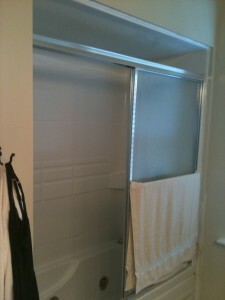 The entire shower was reconstructed to correct damage the prior owner had done and using materials designed to eliminate future leakage problems. 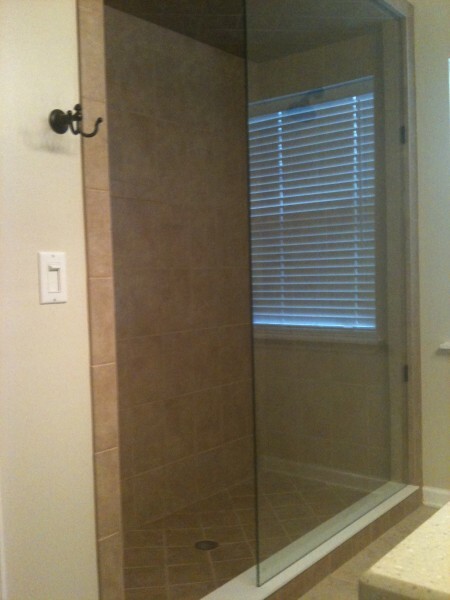 Dreambuilder “brought a great team together for us and turned our drab shower/tub unit into an elegant luxury shower with beautiful tile from top to bottom, rubbed bronze fixtures and an eye-catching single glass enclosure with no hinges or doors,” Ray continued. A decorative tile border was also installed. The end result was not only beautiful but also met the Strickland’s budget. “The project was affordable and we have several customized options that made the reconstruction worth it. We enjoy the space much better and know it added value to our home,” said Ray. To view more pictures of the project, please visit the Dream Home Gallery. Dreambuilder can help you imagine and create the kitchen or master bath remodel of your dreams. Contact us today to get started! Beautiful new shower! Completely updated look…it has a clean spa like feel. Great Job!